Become a plant-based protein pro with the essential IdealRaw Organic Protein Starter Bundle. Everything you need to start your journey toward a healthier, happier you can be found right here. 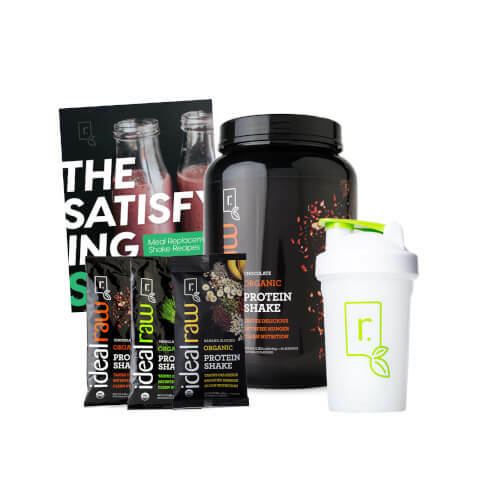 If you’ve been looking for a good clean, organic protein, this starter bundle has it all. And with the ability to try all 3 of our heavenly flavors, we made sure you’re covered. The compact and convenient IdealRaw Shaker Bottle allows you to take your new love for protein wherever you go and look stylish while you do. Start making a difference with your diet and health with the IdealRaw Organic Protein Starter Bundle. That hungry belly won’t know what hit it.